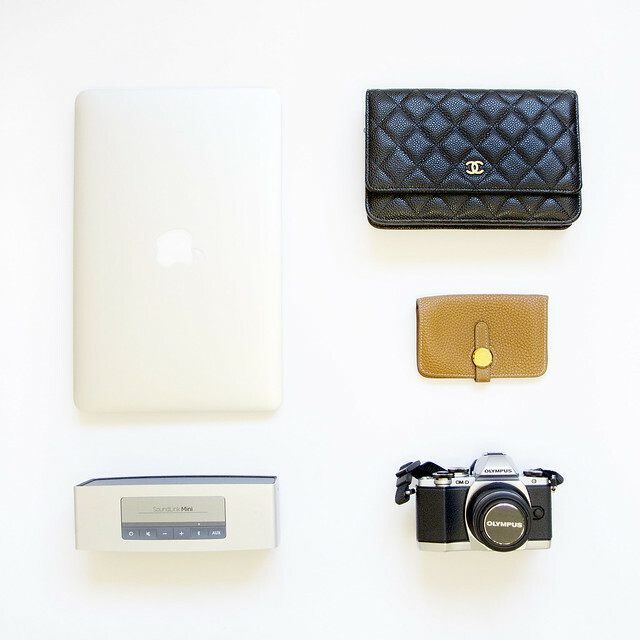 Clockwise: Chanel WOC, Hermes Dogon coin pouch, Olympus OM-D E-M10 with 45mm f/1.8 lens, Bose SoundLink Mini, Apple Macbook Air 11"
One of my biggest pet peeves has got to be clutter. I was born to parents who are hoarders, married to one and given birth to another. I'm constantly on a warpath to de-clutter our flat. It has to be done weekly or else my two roommates (husband and child) will squirrel away more junk in our tiny place. Enough to start our own junkyard. The other thing I've been doing for the past two years is downsizing. I've been slowly replacing some of my things with mini versions that are more lightweight and portable. Frankly speaking, my shoulders and back are killing me these days after years of lugging around too much crap in my bag. I've either given away or sold my heavier bags. Space is a commodity in my flat. Anything that won't cover the entire surface of a table gets a thumbs up from me. These are some of my favorite items at the moment. Frankly speaking, the 11 inch Macbook Air has been one of the best presents I've ever received from the hubby (he now understands that his wife prefers gadgets over jewelry). It's just a tad heavier than an iPad but packs in every feature that I need and more. I can fit it easily into my Louis Vuitton Speedy 35cm. It's so flat and ridiculously fast. Love. Love. Love. It took me years before I finally caved in and bought the Chanel caviar WOC (wallet on chain). *major purchases tend to make me break out in hives* It has saved my rubbish shoulders on numerous occasions, particularly when I'm away all day in London. Have you noticed that bags are getting more and more expensive and heavy? Physiotherapists around the world must be raking it in. I've been on a lookout for a small coin pouch. Just enough for a few bankcards, coins and receipts. The Hermes Dogon coin pouch is just the right size but I've also got my eye on the Comme des Garcons embossed leather pouch which is finally back in stock. The Olympus OMD E-M10 camera is a new purchase. I rarely carry my monstrous Canon camera out anymore unless I'm on a photo shoot. The massive lens attracts waaaaay too much attention, particularly from men (shame to say that neither my friend nor I get a look). The darned thing weighs just over 1.5 kgs and the Olympus is just a third of that. It works just as well as its bigger sibling, if not better but it's far more portable and easier on my back too. What have you downsized lately? I bought a Macbook Air the year before last and it was the best decision - it is SO travel friendly and I don't actually mind the small screen too much. I've been trying to downsize a little too and it makes life easier when your flat is small to begin with! I'm with you. I thought the screen would be too small but the ease of traveling with it made the expensive purchase more worthwhile. It's like carrying around an iPad with the capabilities of a laptop. I got pretty excited reading this post because guess what?! I'm trying to declutter too! I can't be bothered with huge bags and carrying nonsense anymore! And trying to look for a smaller wallet because long wallets would simply not fit if I were to carry smaller bags! Though I still carry books around lol, can't help that! Amen, sister! Alex, it looks like you and I have similar wallets. Mine's bigger than a clutch and doesn't fit in anything except a HUGE bag. I've been trying to borrow/buy e-books these days. I simply can't fit more books into my flat or bag. I am downsizing stuff I am not using. Had lots of stuff in storage and boxes and am selling it or giving away. I love that coin purse. The colour is beautiful. I am desperate to get an Air as well. Do you ever watch DVDs on your Air, and if so what DVD player do you use? I only have a Macbook now, and the DVD player is faulty, so can't use it. Catherine, the 11 inch doesn't come with a DVD drive but I think the 13" does. What I've done is purchased a generic external drive from Amazon for less than £10 and it does the same job. I thought long and hard whether to get the Macbook Pro because it's far better value for money. BUT....I'm really pleased that I went with the Air. It's a dream to carry around. I hope this time i will have a nod to google so i can able to comment here. Anyway clutter free home is what i really wanted to do! Having kids with a hoarder mom ( nay! ) you really need to clean up always and give what you don't really need to breath fresh air from our tiny home. I smile reading your post that gadget is very much appreciated these days as a present from the hub. I just hope i will enjoy the s5 that he gave as i have enjoyed my iphone. But i love that it is lighter on my bag than the latter so it's a big thumbs up for my aching shoulder when i carry my bag. I hope to hear more from you about the macbook air. It's really good to have an add on thoughts for those who already using it than the presentation of the sa alone. Have a great new year ahead of you and to your fam! Hi Angie! Keeping a clutter free house requires an ongoing effort.....(sigh). I was looking at Samsung S5 recently. Do you find it better than the iPhone? Hello again! Just had my S5 less than a month, so far there's no room for me yet to reconsider that the hub should get an iphone for me instead. Still on the side of exploring the phone though and loving the clear capture. The size for my age matters a lot too! Lol. Crossing fingers that the performance do well for years without going to service center for some fixing which iphone did a good performance for me over the past three years. The Macbook Air is fantastic for moving around, but I am quite tempted by the Surface Pro - it can be used like a tablet so it's really one up on the Macbook in that respect. I use a little CDG zip pouch as my wallet some days when I don't want to carry a bag or when I want to use a small bag - it fits handily into most pockets. I find the quality pretty good for the price and should my current full-size wallet need replacing, I'll definitely get a CDG one. I had a look at the price of a Surface Pro. A bit cheaper. I guess you get 2 for the price of one (tablet + laptop). I've decided CDG is the way to go. Affordable and the quality is no different to my expensive Bottega Veneta. I noticed you have pictures with both lambskin and caviar WOCs - how do you find the lambskin has worn with time? How kid-friendly is it with regards to being bumped into and (I almost gasp typing it) potentially being spilled on? I'd love to get a black lambskin WOC because I love the rich, sophisticated look of the leather but know I might reconsider that if I end up with a big scratch a week into using it. Thanks for writing such a lovely and informative blog! I have the same concerns about the lambskin. It's not for the fainthearted though diehard fans may say otherwise. Someone spilled a glass of white wine on my caviar WOC and she freaked out. I thought she was going to burst into tears but hey ho, I dabbed it off with a napkin and spent the next 10 minutes calming her down. As for the lambskin....I wore it out for 2 days and there was color transfer from my black skinny jeans on the entire back of the WOC. Thankfully, it was easy removing the dye using Simple wipes. I'm also pretty clumsy and tend to bump into corners which was why I decided to switch to caviar too. Thanks so much for your experienced opinion! I'm still torn but this has definitely made me consider the caviar as the more viable option. I have a beige caviar WOC and I don't think I realized how much of a beating it takes given my own clumsiness. One last question - did you end up seeing many scratches or corner wear with the lambskin? I used to revive old Chanel caviar bags. After some conditioning and cleaning, they end up looking like new. There were minor discolorations and wear no the corners of my old lambskin WOC even though I was extremely careful. I used to own various Chanel lambskin bags. I prefer caviar because I can take it outside rain or shine and I don't even worry if kids touch the bag with their dirty hands etc. It's so lovely to hear from you! It's been ages. I hope you get to see my reply even if it's so late. My apologies for the delay (sick child who happily passed her germs to me too. Pffft). I haven't heard of the book before. Will keep that in mind. I actually feel so much better having a small closet, a few bags and scarves. Even then, things are still left lying around unused so I guess, I need to downsize a little more.